Skip the store bought bags and enjoy fresh homemade bagels right in your own kitchen – chewy on the outside and soft on the inside, you’re sure to love them! I love carbs and by that I mean LOVE them! Back when I first started college and the Adkins diet was all the rage I even owned a shirt which depicted a pig and a cow dancing and above them it said, “I Love Carbs!” I’ve always been a bug fan of bagels – plain, toasted, fresh from the oven; it doesn’t matter I want to eat it. I also love how versatile they are: breakfast, sandwiches, pizza, snacks or even a side with soup; I just can’t get enough of them. I have made pretzels before in the past, but never bagels and so I decided it was about time. I was so excited to watch them begin to form as I moved through the steps and I was quite pleased with the end result as well. 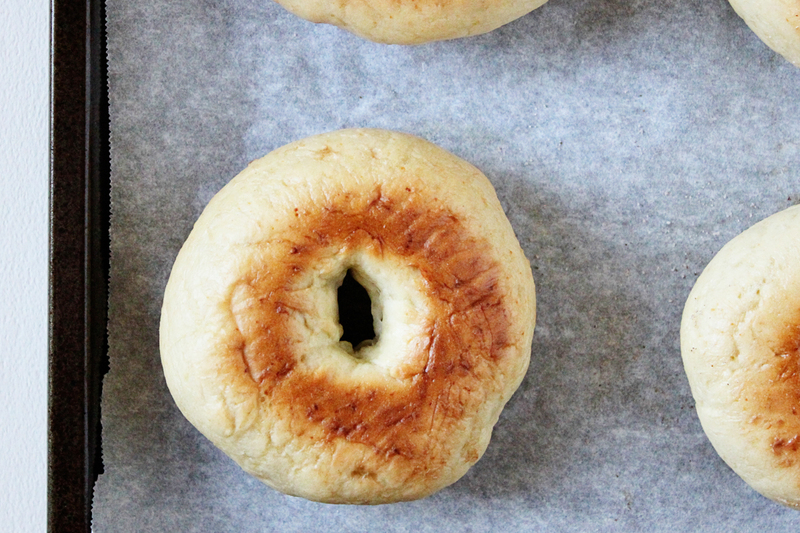 A chewy, soft bagel = delicious warm from the oven with jam or all by itself. This recipe is for plain bagels, but I can’t wait to try different variations on it soon; enjoy and happy baking! In the bowl of your stand mixer combine 1 1/2 c of flour and the yeast. In a separate bowl mix the sugar and salt into the warm water, add the water mixture into the stand mixer and stir on medium/low for 1 minute. Add the remaining flour and stir it in with a wooden spoon, transfer the dough to a clean, floured surface and knead for 2-3 minutes until elastic. Roll the dough into a log and cut into 6 (or 12 for mini) equal pieces. Shape the dough into balls and push a hole in the middle of each circle, gently pulling the hole to about 1 1/2 inches wide. Place the bagels on a baking sheet lined with parchment, cover with a towel and let rise 20 minutes, after the dough rises, broil the bagels for 1 1/2 minutes per side. Bring a large pot of water to a boil and add the last 1 Tbs of sugar, cook the bagels 3-4 at a time in the pot for 3 minutes per side. Remove the bagels and drain on paper towels, place the dry bagels back onto the parchment lined baking sheet and bake at 375º for 20 minutes, flipping after 10 minutes. Remove the bagels from the oven and cool at least 10 minutes before serving. Carbs… you’re not alone. I love carbs too, bread of any kind, pasta, you name it. If it has carbs, I love it. I love homemade bagels. I don’t always have the time to make them though. Yours look delicious though. Popped in from SITS! 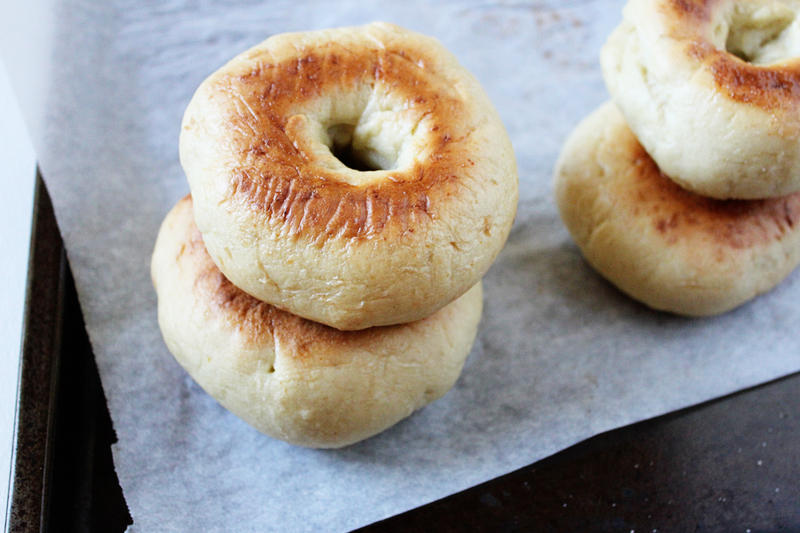 I never knew you could make your own bagels! I didn’t know bagels would be that easy to make. I will definitely have to pin these! These look soo good. I’m a big carb girl too (when I’m not munching on something sweet!) I didn’t even realise they were relatively easy to make too. Nice one. Sounds so easy and looks so good. Pinning to save! These look so good and I love how simple the ingredient list is. When I was pregnant with my son all I ate that first trimester were bagels and cream cheese it seems. Preggo with our second so these must be made asap. Oh how exciting, I hope you enjoy them as much as we did! I’m excited to make these but you don’t show the temperature to bake them at…. What temp would you recommend? Mine turned out really dense. Do you know why? I don’t have a mixer could that be the reason? Thanks. My first thought is the yeast, if it was expired it may not have risen properly? Also if you didn’t knead the dough to a nice elastic texture that may have been to blame? I’m wondering did you make very large bagels? Had to come back to tell you– I made these last night and they turned out AMAZING! I would never have thought to broil them but it adds so much volume and texture. I added a cheddar cheese blend, fresh green onion and garlic powder to mine and they were DIVINE! Thanks so much for sharing! That does sound divine! I am so glad you enjoyed them! I am also a huge carb fan and bagel-lover. My husband tried to make bagels once, but they kinda failed, but we will have to try out your recipe! I love bagels (and carbs!). I’ve never thought about making my own bagels. Thanks for the recipe. Happy SITS Day! We love bagels at my house! Thanks for sharing this recipe. Have a wonderful SITS day today! Bagels are so versatile! These look delicious! This makes me wish I could eat wheat so bad! Those look easy enough! I’m going to have to try them sometime. Bagels are delicious. Thank you for the recipe. I might try it with gluten-free flour and see what happens. Enjoy your SITS Day. Oh my gosh. Need to make these. I never knew how to make bagels at home- I kind of always assumed it required special equipment. Silly me! What a nice (vegan friendly) recipe for me to try! Although, I have never used my broiler! I have an obsession with bagels so I can see how I’m already drooling over these. Oh I have never baked bagels before! This looks so good and simple! Pinning this! Happy SITS Day! Those bagels look delicious – making bagels is one of my 2013 resolutions 🙂 Happy SITS Day! I’m a carb addict!! I may have to try this recipe out. Thanks for sharing. These look delicious! I have a bagel for breakfast at least twice a week. I am all over trying this out!